Have a laugh with Jill as she shows you the steps! . . . you’ll be dancing in no time! You are never too old to learn a few basic moves and lots more if and when you are ready. 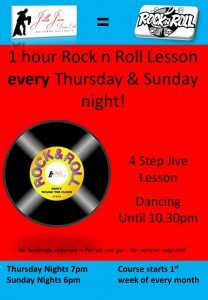 We teach a very versatile 4 Step Jive, that can be danced to a wide range of music. Everyone learns at their own pace. Beginners will benefit by starting 1st or 2nd week of each new month. You can start our lessons at anytime. Our lessons run 1 – 4 weeks throughout each month. We teach different moves each month to increase your skills. Beginners will benefit by starting on the 1st or 2nd week of each new month.